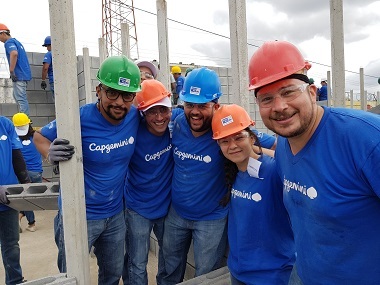 Not just classrooms – Capgemini Guatemala builds lives! 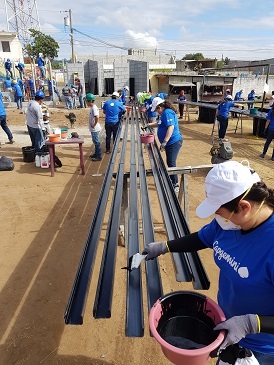 Capgemini Guatemala’s Corporate Responsibility & Sustainability (CR&S) program is working towards uplifting the disadvantaged communities in the small town of Ciudad Quetzal. Innovation Nation caught up with Alejandra Salazar, Head of HR Capgemini Guatemala, and Claudia Lopez, Internal Communications, CR&S Guatemala, to trace the evolution of Guatemala’s CR&S journey and learn more about the of their “Building a Better Future for Children” project. Alejandra, Claudia, welcome. Could you start by talking us through Guatemala’s CR&S journey in the past decade? Alejandra Salazar: Yes, of course. Guatemala’s CR&S program has—together with our delivery center—grown over the past 10 years. In 2008, when we first began operations in Guatemala, our CR&S program was dedicated towards supporting a single community project. By 2010, we were involved with 13 different social projects, supported by our various engagements. While there was a lot of fantastic work undertaken by our teams that started to gain the interest and commitment of our people, it soon became clear that our CR&S initiatives were fragmented. Claudia Lopez: The main challenge was to bridge the silos and focus on one common project. Our past experience also helped us understand that it was important for us to support projects within Guatemala City, as it makes it much more accessible for our people to volunteer, and they can witness the immediate impact of their efforts within the community they live and work in. In 2015, we started listening closely to what our employees had to say, and the sentiment around the center was that our people wanted to stay more involved within the community. And that’s how the idea of our Goodwill Ambassadors volunteering program came into being. Can you tell us about Capgemini Guatemala’s “Building a Better Future for Children” project? Alejandra: In the spirit of the “Power of One,” we decided to do something big, and we wanted it to be a proposal that came from our people. With several social problems plaguing communities in Guatemala City, we partnered with United Way Guatemala —a “not-for-profit” organization that aims to improve the quality of life of the most vulnerable people in Guatemala—to identify the areas where the need was most accurately felt. We also conducted an employee survey to help us identify the social cause that our people were most interested in getting involved with. 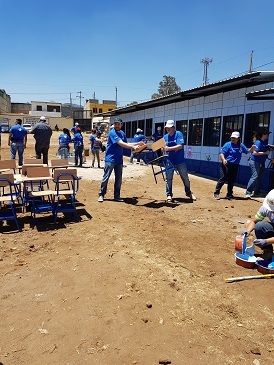 The “Building a Better Future for Children” project, which aims at improving infrastructure facilities of schools for disadvantaged children within the Ciudad Quetzal area, emerged as the clear winner gaining more than 70% votes. The “Building a Better Future for Children” initiative has gained a lot of support and participation from our people. For the past two years, over 55% of our employees have contributed 1% of their salary every month towards this cause. On top of this, Capgemini Guatemala donates one dollar to the project for every dollar donated by our employees. It’s our way of telling our employees they are not alone—we’re doing this with you! What has the impact has building schools been on the local community? Alejandra: The impact has been terrific! By focusing our efforts on improving the quality of elementary education and infrastructure facilities in the three schools so far, we’ve been able to create an impact that far exceeds, and is not limited to, motivating these children. Makeshift classrooms with tin roof-tops have been replaced with brick and stone, the children now have desks to use, and rats don’t run around the classroom anymore! We’ve been able to provide these children with a safe and healthy environment, empowering them to build their careers and chase their dreams. Claudia: But it doesn’t stop there! This project has had far reaching consequences on the entire Ciudad Quetzal community. We’re building more capacity in the schools and have witnessed a steady increase in enrollments, with parents now encouraging their children to attend school. This has positively impacted the community through a decrease in the rate of juvenile delinquency and incidents of child substance abuse. How does being a volunteer benefit the Guatemala team and the organization as a whole? Claudia: Being a part of the Guatemala CR&S program is a very rewarding and lasting experience for our people. It provides an avenue and platform to those who want to give back to society and make a difference, but may not always have the right opportunity or guidance. Alejandra: The volunteering experience also helps build team spirit and unites our employees like nothing else. When we’re out constructing a school, there’s no room for differences or hierarchy—everyone just works together! It’s a very leveling and grounding experience. Claudia: Volunteering also helps develop our employees’ leadership skills, and it’s great to see how our people take the lead and motivate others to complete the set goal. As a result, our employees feel proud to be associated with an employer that gives back to the community. This has helped strengthen the commitment of our people towards us, and has also had a positive impact on our retention. Finally, what’s next for CR&S in Guatemala? Alejandra: Although we understand that we still have a very long way to go in improving the primary amenities, infrastructure facilities, and elementary requirements, we’d like to channel the Capgemini Group’s CR&S ambition around empowering children with “digital” skillsets to our communities. “Digital” will provide the children of Ciudad Quetzal with a level playing field within current market trends. Claudia: As a first step towards digitalization, we’ve already built a computer lab in one of our schools. However, this is just the beginning, and we will continue to introduce technology to schools and build digital capabilities, so that our children can stay future-ready and prepare themselves to face the demands of the global market. Alejandra: We continue to keep our people up-to-date on what’s in store for CR&S in Guatemala, and like always, we continue to rely on them to voice their views and count on their support. Watch this space! Alejandra Salazar is an HR professional with over 15 years of experience. Alejandra joined Capgemini Guatemala in 2009 as an HR manager responsible for delivering HR solutions. In 2013, CR&S was taken under the HR umbrella and Alejandra was tasked with creating and leading a CR&S program that leveraged the commitment and dedication of the Capgemini Guatemala team, while having an impact on the wider community in Guatemala. Claudia Lopez is a graphic designer with over 10 years of experience in corporate communication. Claudia joined Capgemini Guatemala in 2014 as an internal communications specialist. In 2015, Claudia became part of Capgemini Guatemala’s CR&S team, helping to develop and deploy a new phase for Guatemala’s CR&S program.